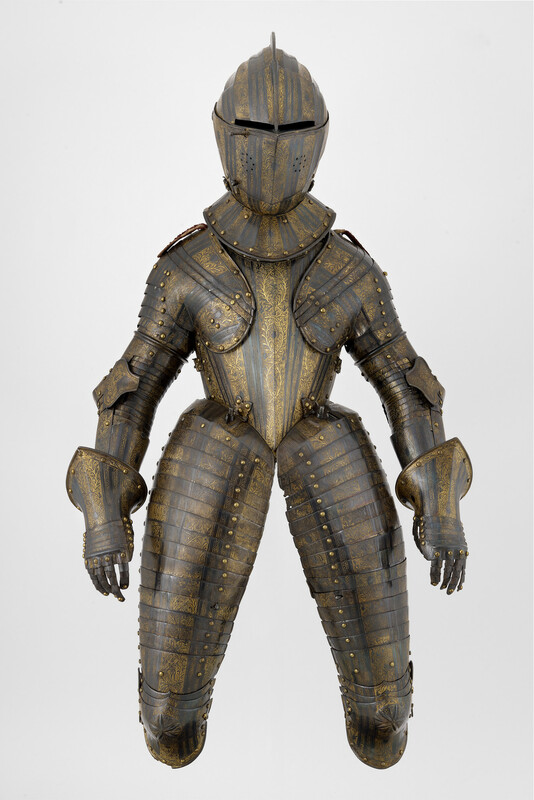 Cuirassier armour of Henry, future Prince of Wales, consisting of a close helmet for the field, a gorget, a cuirass, a pair of tassets with detachable extensions to the knees, a culet, a pair of symmetrical pauldrons and vambraces, a pair of gauntlets and a full shaffron. The whole surface of the armour is decorated with bands of etched ornament. The bands are etched alternately in line with gold in the lines on a plain ground and, in relief, against a gilt ground closely covered with scribbled dots and semée of drops of fire. In the former, the decoration consists only of two parallel bands of stylized roping formed by raked Zs, each enclosed between two lines, and enclosed overall by a single line near each side. In the latter, the decoration consists of entwined laurel or olive foliage tied with a fillet in base, alternating with ovals edged with palm fronds crossed at each end and tied in base in the same way, framing a hand looking-glass apparently wreathed in fire or feathers. Some of the ovals frame small classical figures. The ground within the etched features is plain and fire-gilt. The turned free edges of the armour are followed throughout by a narrow band etched in line with gold in the lines, and consisting of a running scroll of foliage on a diagonally hatched ground. The armour appears in two miniatures of Henry, future Prince of Wales (1594-1612) by Nicholas Hilliard (1547-1619), one of which is dated 1607. Both show the armour white and gold without any traces of colour of any sort. However, with the exception of those of the shaffron, all the surfaces of the armour are now gilt and a very dark blue. The blueing was probably applied in 1902, at the same time as that on the future Prince's armours for the tilt (RCIN 72830) and for the field, tourney, tilt and barriers (RCIN 72831). The shaffron, which did not arrive at Windsor until 1914, retains its original white-and-gold colour scheme. Measurements: Helmet: height 33.0 cm, width at gorget-plates 21.6 cm, depth, 35.9 cm; Gorget: height 16.5 cm, internal diameter of neck 10.5 cm; Breastplate: height 38.6 cm, width beneath arm-openings 24.9 cm, width at waist 22.3 cm; Backplate: height 33.4 cm; Right Tasset: height without extension 35.4 cm, height with extension 61.0 cm, width 23.2 cm; Left Tasset: height without extension 33.4 cm, height with extension 61.0 cm, width 24.2 cm; Right Tasset-Extension: length 29.2 cm; Left Tasset-Extension: length 31.1 cm; Culet: height 18.8 cm, width 36.1 cm; Right Pauldron and Vambrace: length 55.6 cm, width of pauldron 21.6 cm; Left Pauldron and Vambrace: length 55.8 cm, width of pauldron 21.6 cm; Right Gauntlet:: length 25.1 cm; Left Gauntlet: 25.1 cm; Shaffron: length 51.1 cm, width above eyes: 23.4 cm. Weights: Helmet: 0.652 kg; Gorget: 0.652 kg; Breastplate: 1.106 kg; Backplate: 1.035 kg; Right Tasset: 0.964 kg; Left Tasset: 0.907kg; Right Tasset-Extension: 0.709 kg; Left Tasset-Extension: 0.737 kg; Culet: 0.738 kg; Right Pauldron and Vambrace: 1.729 kg; Left Pauldron and Vambrace: 1.673 kg; Right Gauntlet: 0.255 kg; Left Gauntlet: 0.255 kg; Shaffron: 1.219 kg. Tests undertaken by Dr Alan R. Williams on the rear gorgetplate of the helmet show it to have a microhardness in the range 146–191 VPH (average 166 VPH). It is largely composed of iron with numerous irregular slag-inclusions. The iron, however, is accompanied by an irregular narrow band of mixed iron and a carburised iron (pearlite) with a carbon content of about 0.1%. The boundary between the two is marked by a row of slag-inclusions. This seems to be the relic of a folding operation, most likely carried out when the original heterogeneous ‘bloom’ produced in the furnace was turned into a plate, or possibly where several fragments of metal have been forged together. The upper cannon of the right vambrace is similarly constructed but the carbon content of its mixed band is about 0.2–.3%. It is estimated to have a microhardness in the range 150–80 VPH.